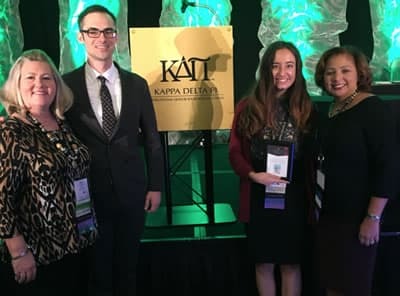 UNC Charlotte’s chapter of Kappa Delta Pi, the international honor society in education, has continued an award-winning streak with a pair of honors at the 52nd Kappa Delta Pi Convocation. KDP received the Program Award for Professional Development and Literacy Alive Bronze Award, recognizing the impactful programming and service provided by the chapter during the last two years. The program award recognizes chapters for demonstrating excellence in one of six areas: service, professional development, fundraising, membership, education for sustainability and communication. This year, the Omicron Pi Chapter received the award for professional development for Teacher Toolbox Tuesdays. These one-hour professional development workshops are held once a month for pre-service teachers. Topics include classroom management, wellness and self-care, building relationships, using data to differentiate, strategies for working with students with special needs and how to get hired for top teaching positions. Since 2011, the Omicron Pi Chapter has offered 149 workshops to more than 3,035 pre-service teachers. For the 2017-18 Literacy Alive project “49ers Read-In,” the Omicron Pi Chapter received a bronze award. In April 2018, Omicron Pi hosted 160 second-graders from Newell Elementary School for the ninth annual and final Literacy Alive 49ers Read-In. The semester-long project included three events: a read-in at Newell Elementary, a daylong campus visit and a reflective writing activity. The campus visit included tours, lunch, STEM activities, a college life panel and interactive reading activities. Partners for the event included the Cato College of Education, Teacher Education Learning Community, Student N.C. Association of Educators, Center for STEM Education and Phi Kappa Phi Honor Society. Volunteers logged approximately 250 hours in planning and hosting the event. The 52nd Kappa Delta Pi Convocation was held at the Hyatt Regency in Indianapolis, Indiana. The event included more than 75 workshops, keynote speakers, idea exchanges and networking opportunities. Omicron Pi Chapter counselor Misty Hathcock and two officers, President Sarah Hutchinson and Fundraising Co-Chair Fabienne Francis, attended. Omicron Pi was featured as one of six chapters for its excellence in programming and one of five chapters for its pilot of the Celebration of Teaching, a new signature service initiative for KDP. Hathcock, also director of alumni affairs for the Cato College of Education, served as the keynote speaker for the Counselors Luncheon, where she was honored for 14 years of service as KDP counselor and her leadership; her chapter won the prestigious 2017 Florence B. Stratemeyer Award for Chapter Excellence (formerly ACE of the ACE). Photo (left to right): Chapter counselor Misty Hathcock, KDP regional chapter coordinator Joe Clemmer, chapter president Sarah Hutchinson and chapter fundraising co-chair Fabienne Francis.